Mural artists work in unusual places, and it’s important to know the risks involved. 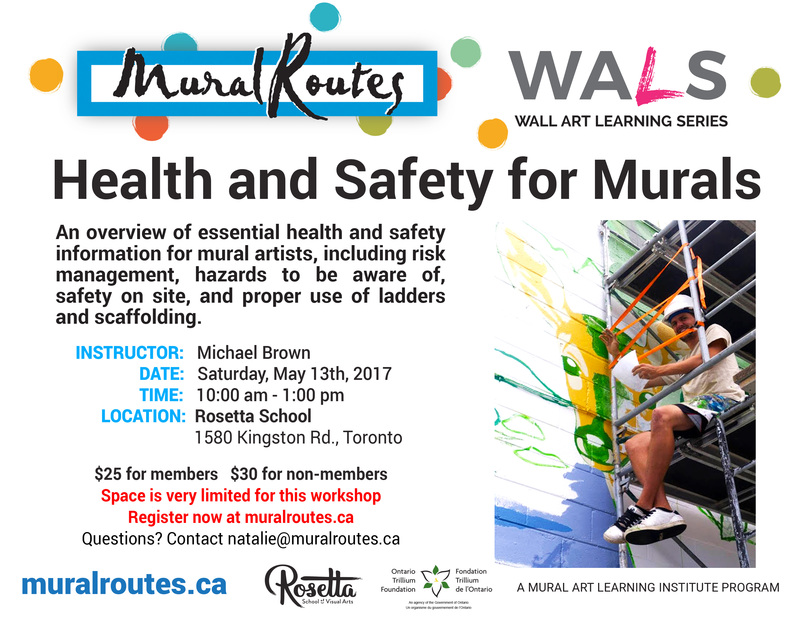 Join us May 13 to review important health and safety tips for mural artists, including hands-on practice with ladders and scaffolding. This is also a great chance to network with fellow artists and project managers, including our Mural Art Career Development students. A pizza lunch will be provided. Geared towards emerging or mid-career mural artists or project managers. Registration: $25 for Mural Routes members or Scarborough Arts members, $30 for non-members. Register below. Special thanks to Scarborough Arts for partnering with us on the WALS: Behind the Scenes Series, and to the Rosetta School of Visual Arts for generously providing space for this workshop.